I had talked to Conch Republic Divers (CRD) some on the phone. They had been recommended and were south of Pennecamp Park, which was an area that I wanted to see. It seemed that they had had a group of divers coming all week to look for lobsters. Apparently they had been doing well, but were going to Key West the next day and then diving again the day after. That seemed like something good for me, but I asked if they had any intention of diving the Duane. Cynthia at CRD said that she could look into it. Sure enough, they would be going out Thursday and were willing to dive the wreck. The boat was nice and far bigger than need for 5 divers. It is only a short trip out to the reef and the swell was minimal. The water is clear and inviting. I could see that we were just a bit south of Pennecamp Park and there were areas where the reef was shallow enough for small waves to be breaking. We all geared up as the boat travelled to the site. The skipper came down and talked a bit about the dive. If the current is bad and sweeps you off the wreck, you will not be able to swim back to it, so surface. We are parked at the float line that comes up from the bow. You descend it and at the end of the dive, come up the float line at the stern of the wreck. Keep together, don't touch, racheda, racheda, racheda. We all hopped off together and went for the float line that came up from fron the bow of the ship. Nobody here was clumsey. These were divers. One of the two women had a camera with her. The ship could be seen from the surface and looked about 60 feet deep in the clear water. It is also the biggest wreck I had ever seen like this. As soon as we started down we could see about 20 large barracuda in formation above and to the side of the front deck. It's amazing how the just don't seem to move from their position at all. I wonder what they are waiting for. The current was mild and when I got to the deck I had to grab water and my BC inflator so that I would stop without hitting the deck. I managed not to touch, but not all the other divers quite avoided it. The deck was at 105 feet instead of 115, which made me happy. That would make it a textbook NITROX dive. The front deck had a large hole in it that I recognized as the base of a deck gun. It would have looked neet if they had left it in place. Growth on the deck was still thin. I don't know how long this ship has been submerged. I could see some incrustations of coral, but I have no idea what they would look like with a few years of growth. The group moved to the superstructure. I pointed out a large scallop to the diver with the camera, but it closed before she had a chance to get a shot. Also, it was lacking any brilliant colors like I have seen in the mantles of other types of scallops that I have seen. She took pictures and the rest of the divers looked through the open doors and ports. We were not supposed to do any kind of penetration of the wreck. At one point a diver was looking in through a door, so I decided to look in too. Sure enough, there was a school of small fish of some kind, swimming around inside. I noticed that we were under a stair well. The landing at the top of the stair was trapping our air like it was floating quicksilver. Maybe I'm easily amused, but I had fun looking at this. We slowly moved towards the back of the ship. We were all cruising generally along the port side. There was not enough current to cause any kind of a problem. Some divers went high above the weather deck. Some went along the railing. 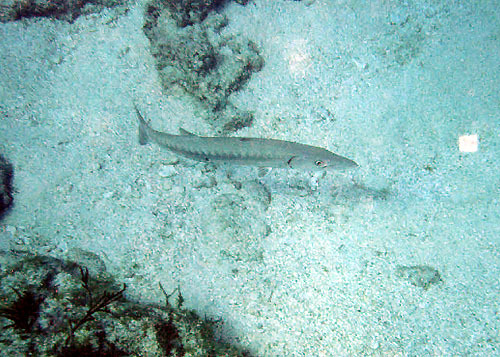 I decided to charge another barracuda that was on the deck. It didn't move even when I got about 2 feet away. Neet looking fish. We continued to the back deck, where there is the body of a winch. Most of the parts are stripped, but it was easy to see that this had been a very big winch. As I went beyond that, I saw what I think was the best view on the wreck. Look towards the stern with the sun behind the conning tower. The top of the tower is about 50 feet above the deck. It is a really beautiful sight. Before long we had all puttered back to the stern line. I headed up first and found where I wanted to park at about 20 feet. Everyone else was following and hung out where their various devices said that they belonged. The barracuda were stationed where they belonged. Stops can be fun. We all ended up on the surface hanging on to the float line. For some reason, I ended up on the boat well before anyone else. I climbed on and sat down where my tank belonged as they request you do. They immediatly put a bungy on my tank, which seemed like a good thing and probably was, usually. Unfortunately, it was not such a good idea this time. I tend to get a bit illish just after the end of the first dive. I did this time too. Unfortunatly my tank was strapped down and I was still strapped to it. Well, I got most of it past the back of the boat and the next wave removed the evidence. Wow, that was a beautiful dive.